Domino (Japanese: ドミノ Domino), also known as 009 and Black Tulip, is an elite officer within Team Rocket. 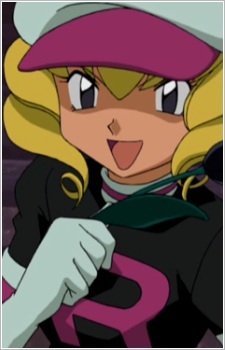 Her past before Team Rocket is almost completely unknown, and she claims that Domino is not her real name. Her true personality remains a mystery. She can be cheerful one moment and all business the next, depending on the situation. She has a quick temper, but can restrain it as the mission calls for. However, when the Boss gets mad at her, she takes it out on lesser agents.